WooCommerce is a storefront and shopping cart plugin for WordPress. While it is not possible to integrate purchases from your WooCommerce shopping cart with E-junkie, you can set up a product page in WooCommerce to use an E-junkie purchase link URL. This would allow our system to process an order for that item (issue download links or codes, send emails, log the order details) after completion of the buyer's payment. If you would still be using the built-in WooCommerce cart to sell other products that don't involve E-junkie, your E-junkie items could not appear in that cart, so to avoid buyer confusion we'd advise using an E-junkie Buy Now link that bypasses any cart to take buyers directly to instant checkout for that single item. However, if you will be using E-junkie to sell all your products, and only using WooCommerce as a storefront-builder without its built-in cart, you can use E-junkie Add to Cart links to let buyers order more than one item at a time and take advantage of E-junkie features that depend on our cart (e.g., tax/shipping calculation, editable item quantity or price). Note that in this case the E-junkie cart would need to display in a new window/tab, as WooCommerce would not be able to support our standard overlay-style cart display within your own page. 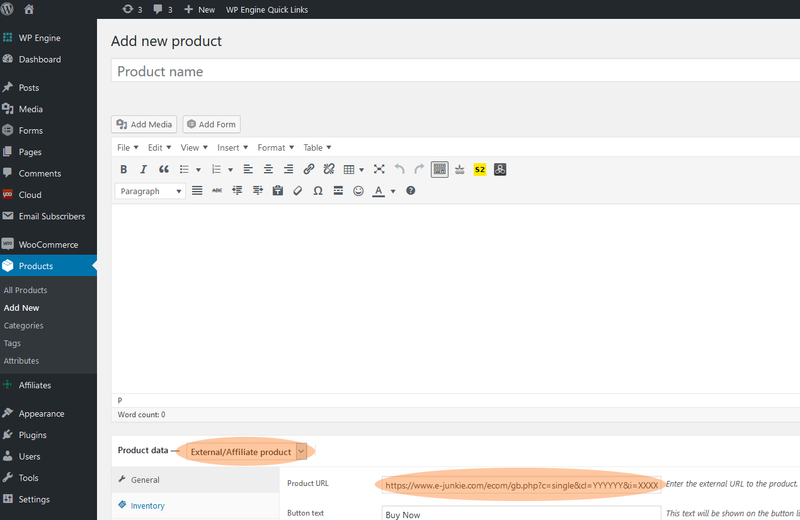 That will reveal a Product URL field where you can paste the E-junkie purchase link URL for your product.